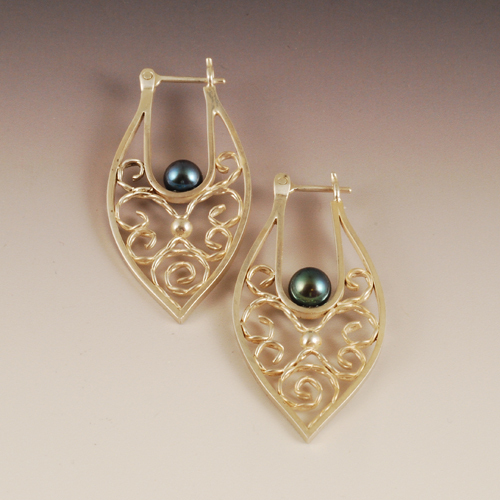 The final project of the Earrings class involved filagree and making tiny mechanisms. 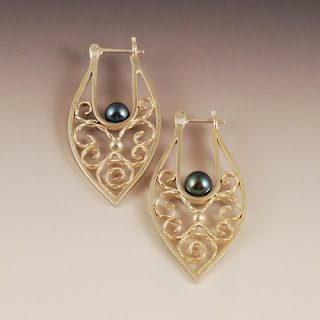 First we flattened square wire into rectangular wire, then cut, formed and fused it into the perimeter of the earrings. Then we twisted and flattened the filagree wire to cut & form into the delicate pattern. Once that was all wedged into place with just the right amount of tension, we fused it all in place. My slightly different design included the silver balls which were placed after the wires were secure. clasp, both soldered onto the top of the earrings. Finally, we glued pearls onto a soldered post in the center. Gorgeous. I wish I could see the earring catch from the other side. You sure did a beautiful job! Thanks, all! Jennifer, I promise to take a photo at a different angle for a near future post.